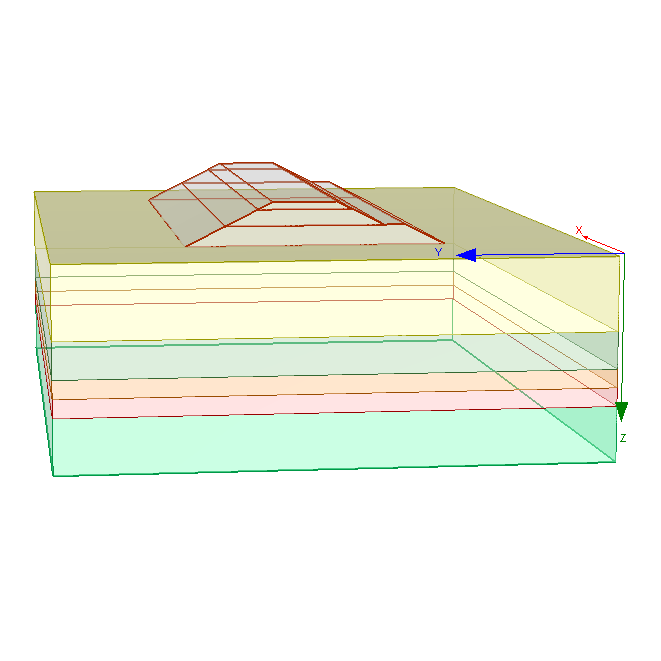 Settle (formerly Settle3D) is a three-dimensional program for the analysis of vertical consolidation and settlement under foundations, embankments and surface loads. The program combines the simplicity of one-dimensional analysis with the power and visualization capabilities of more sophisticated three-dimensional programs. You can quickly create complex soil profiles and loading conditions, and view results in three dimensions. Modeling can be staged, and time-dependent consolidation analysis can be performed including primary and secondary consolidation (creep) at user defined time intervals. Linear and non-linear materials can be modeled. Groundwater elevation can be staged, and horizontal and vertical drainage conditions can be specified. Circular, rectangular or polygonal load shapes can be defined with uniform or variable load magnitudes, and flexible or rigid foundations. Loading can be staged and applied at any depth (e.g. to simulate piles or raft foundations). Excavations can be defined, and loads applied within excavated areas. A special embankment designer allows you to easily define multi-stage layered embankments. Back analysis options allow you to determine the pre-load fill height or time required to achieve a given settlement. Loading stresses are calculated in 3D, and pore pressure dissipation and settlement are calculated along 1D strings. Results can be contoured along any horizontal or vertical plane or plotted along any line. Settlement deformation can be viewed in three dimensions, magnified by a user-defined scale factor. Data presentation is highly interactive, and contours and graphs are updated in real time as you change the data type, depth or location. Results can be exported to Excel with a single mouse click. Users can now define a non-horizontal ground surface using boreholes. 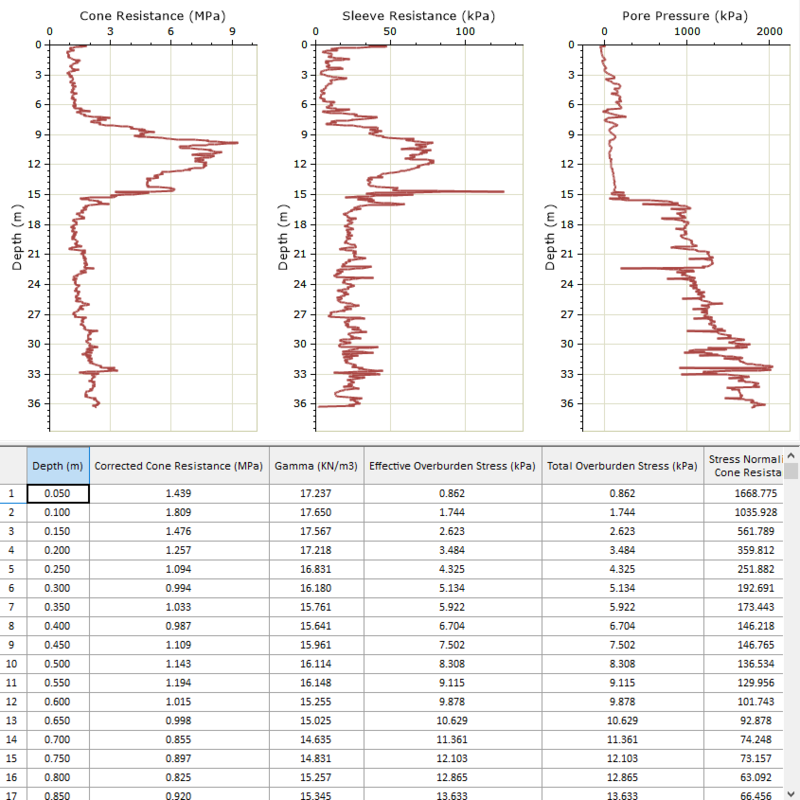 By defining a top elevation for each borehole, a ground surface is interpolated. Results can be computed using a query point, query line, and field point grid options, or on the new 3D surface contour. Horizontal loads (i.e. wind turbine loads) can now be entered in Settle. Both horizontal and vertical loads can be defined for the Boussinesq and Westergaard stress computation methods. In addition to the ability to model horizontal loading, a number of new results are now calculated in Settle, including Loading and Effective Stresses in X and Y directions, among others. Interactive editing features make it extremely easy to edit the model geometry. Boundaries can be moved, deleted, copied, stretched, and convenient right-click shortcuts simplify editing even further. Although model geometry is primarily edited in the 2-dimensional Plan View, some editing options are available in the 3D view using right-click shortcuts. Load and excavation boundaries can be imported into Settle from a DXF file with the Import DXF option. You can select which entities you would like to import, using the checkboxes in the DXF Options dialog. Boundaries can also be exported from Settle to a DXF file with the Export DXF option. A liquefaction analysis can be carried out in Settle based on Standard Penetration Test (SPT), Cone Penetration Test (CPT), and Shear Wave Velocity (VST) data. The liquefaction analysis results are displayed in chart form and are easy to interpret. The chart displays are fully customizable in terms of markers and lines, legends, fonts and colors. Each part of the liquefaction analysis (Data, Triggering, and Post-Triggering) is displayed in its own tab. Each chart can also be toggled to full-screen. In addition, for each aspect of the liquefaction analysis you can use checkboxes to select which methods' results you want to display. The new Cone Penetration Test (CPT) analysis module can be used on its own as a fully-functional CPT interpretation software. 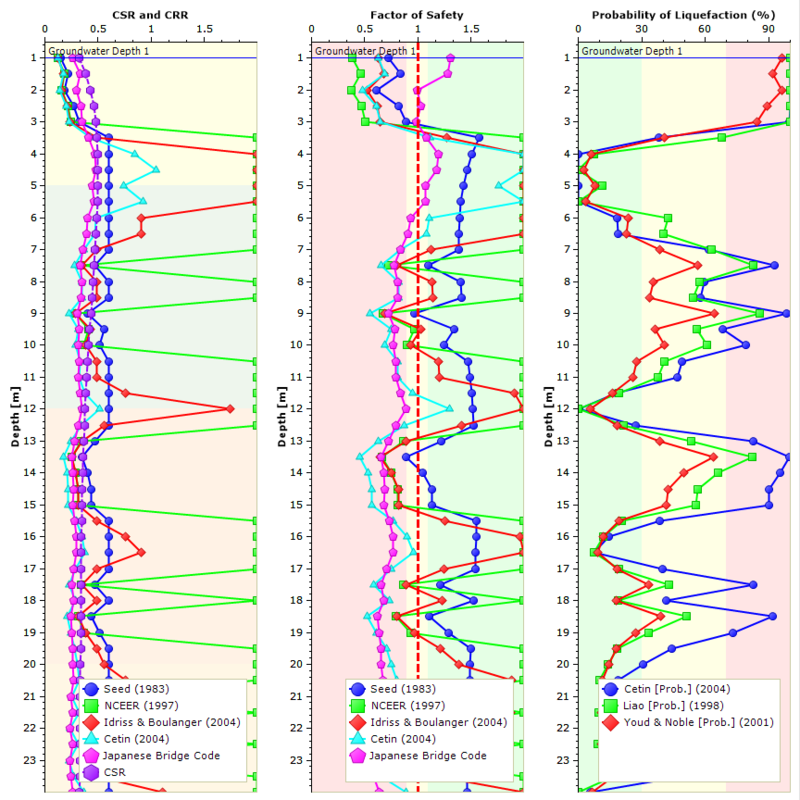 In addition to this, the CPT analysis feature can be used in conjunction with the liquefaction analysis module, or in conjunction with the Boreholes function to model a non-horizontal soil profile. The empirical methods can only be applied to rectangular or circular loads. You can apply any or all methods to a given load. The calculated empirical settlement is displayed in the Plan View, for all currently applied methods. The Boussinesq method uses the theory of elasticity to calculate the vertical stress under a point load in a homogeneous, semi-infinite half space. To compute the stresses under a distributed load, the Boussinesq solution is integrated over the area of the footing. The Multiple Layer method considers the stiffness (elastic modulus) of each soil layer, when computing the stress distribution due to loading. If the soil layers have significantly different stiffness values, then the resultant stress distribution can be very different from the Boussinesq solution, which assumes homogeneous elastic properties. The 2:1 method assumes that the zone of influence for an applied rectangular load has a slope of 2:1. For a non-rectangular footing, the stress is calculated by computing the area of the load at the surface. With increasing depth, the area over which the load is applied increases at a 2:1 ratio and the magnitude of the loading stress decreases correspondingly. If your analysis includes groundwater, a region of vertical wick drains can be defined with the Add Wick Drain Region option to accelerate the process of soil consolidation. The area of a wick drain region is a user-defined polygon in the Plan View. The wick drains can also be displayed in the 3D view. If wick drains are defined then you can specify the ratio of horizontal to vertical flow for each material.